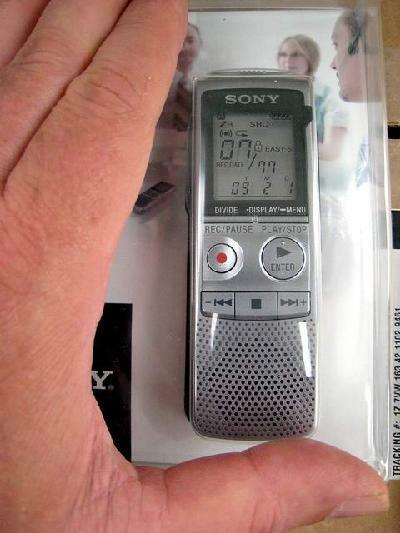 I am in Orlando (May 19, 2009) and I have 10 of these digital voice recorders in my suitcase. When I get back to Nairobi I will send them on to the Congolese studying translation at the Shalom University of Bunia. These little $35 devices will improve the quality of the Bible translations those students do when they graduate. The students will take these back to their home areas during the “summer” vacation. They will use them to record people telling stories in their languages. They will then write those stories down and study them in depth. Now how will that help? People who want to write for a living take time to study their own language. Journalists study how to write in English, even when it is their mother tongue. Those who want to be writers take courses. Even those to translate the Bible into English also study English. But most Congolese languages have never been written. The Congolese Bible translators will be among the first to ever write their languages. They cannot study good style, how to write clearly, or any other topic about their language because no one has gone before them. But people do speak the language, even if they don’t write it. So, instead of studying writing the language, we study the speaking of the language. This leads to some interesting discoveries that avoid errors in the translation and make the translation clearer. In one case, the verse “Don’t steal from widows”, when translated like that created gales of laughter. That is because it means “Don’t steal from widows, steal from others instead.” To keep the original meaning, one has to “front” the subject and translate “Widows ladies, don’t steal from them.” The recordings show that this language fronts the subject all the time. The translators see this pattern and that makes their translations clearer, and more accurate.